Politics aside, (mostly ? 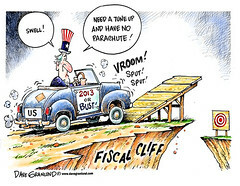 ), going over the Fiscal Cliff may not be such a bad idea. Obviously the President is ready to do so, and has said as much, through Tim Geithner. Why would the President want to do that? Because after taxes go up, it is easier to propose a reduction in taxes for some as part of a deal, rather than raising them. After the Cliff, taxes will go up on everyone, and then any proposed tax decreases, if only on the middle class, would be a step forward. The Cliff also forces entitlement and defense cuts, which are impossible to pass positively with normal legislation. But by enforcing those cuts, every new budget would have to work from this lowered baseline. Just passing a stop-gap fiscal measure will apparently to nothing to cut either defense or entitlements. There is a “no cost benefit” for both Democrat and Republican for passively allowing cuts to entitlements. Since anyone who proposes cuts to Social Security or Medicare immediately becomes the target of the left, neither Democrat or Republican can afford the consequence. Every time Republicans have tried, they have lost big time: in 2006 and 2012. Entitlements are the Democrats’ bread and butter and can’t ever vote for any cuts. So, if Obama starts with the cuts and then proposes raises to spending, if not the full raises in the current system, he looks like a hero. Plus, he can blame the Republicans for any fallout. If the Cliff happens, the President thinks he will have more leverage and can blame Republicans for tax increases on the middle class and a slowing economy. It is a win-win for him… that is, unless of course, the economy completely implodes and causes a depression, for which he will try to blame Republicans, but such a course may end up backfiring. The fact that he wouldn’t compromise may come back to bite him. If there is no recovery and we are thrown into another four years of crises, it may be hard to pin the blame on the House of Representatives. Of course, with all the help the pandering media is sure to give him, he may succeed. After all, finding a scapegoat for all the world’s evils is a proven political strategy. Just ask Adolph. On the positive side, if the Cliff happens, the rich are taxed more, along with the middle class, entitlements and defense are cut, and austerity is forced upon us, and it seems like a better place to start balancing the budget than just extending current spending and tax rates with patchwork agreements. The course of extending the current system will only ensure unsustainable, unbalanced budgets for years to come, leading to eventual inflation or economic collapse. ← Why Merit Pay for Teachers is an Incredibly Stupid Idea.